The New Jersey, Eastern Pennsylvania, and Delaware Higher Education Recruitment Consortium (HERC) connects thousands of job seekers to employment opportunities at our member institutions, including colleges, universities, teaching hospitals, and research institutes. Our aim is to advance equity and excellence in higher education workforce in New Jersey, Pennsylvania, and Delaware. We help job seekers secure faculty or staff positions at higher education employers that value diversity and inclusion. We accomplish this goal via our job search feature and by providing expert career advice, including webinars, for those on the job hunt for higher ed careers in NJ, PA, and DE. When pursuing a career in higher education in New Jersey, Pennsylvania, and Delaware, you may also need to consider employment opportunities for your spouse or partner. We support dual career couples through our dual career search feature and provide resources for couples conducting concurrent job searches. Even if you’ve never considered a career in higher education, there may be a position for you. In addition to faculty and administrators, our higher education members hire a wide variety of positions, including legal and financial staff, executive assistants, communications staff, IT professionals, maintenance technicians, and more. With HERC, you can perform job searches for New Jersey, Pennsylvania, and Delaware employment opportunities as soon as they are posted, create email alerts for relevant job openings, build your user profile to help your ideal employer find you, and access career advice. 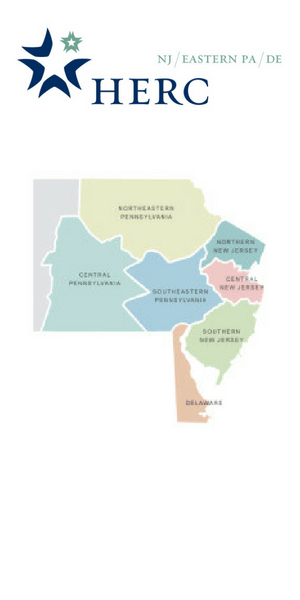 Visit the New Jersey – Eastern Pennsylvania – Delaware member portal on HERConnect and learn how HERC helps promote your higher ed careers in New Jersey, Eastern Pennsylvania, and Delaware.